We wanted to grow a few seedings. Some varieties that are hard to find, as transplants, at garden centers. 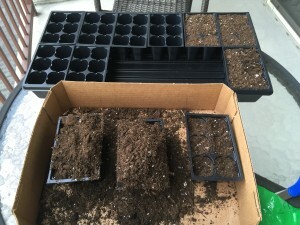 We decided to purchase a Jiffy® seed starter kit and add our own potting soil to the six-packs. 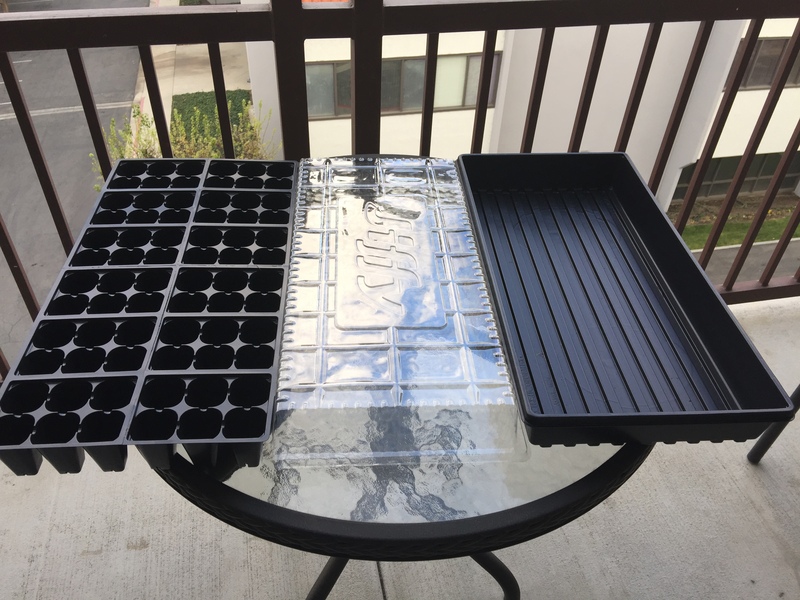 We chose this system for several reasons: 1) It has trays that will separate into six-packs; 2) It has a tray to hold the six-packs; 3) The tray will also hold any watering overflow; 4) It had a clear plastic cover. 5) The Jiffy kit was also reasonably priced and individuals parts could be purchased separately later. 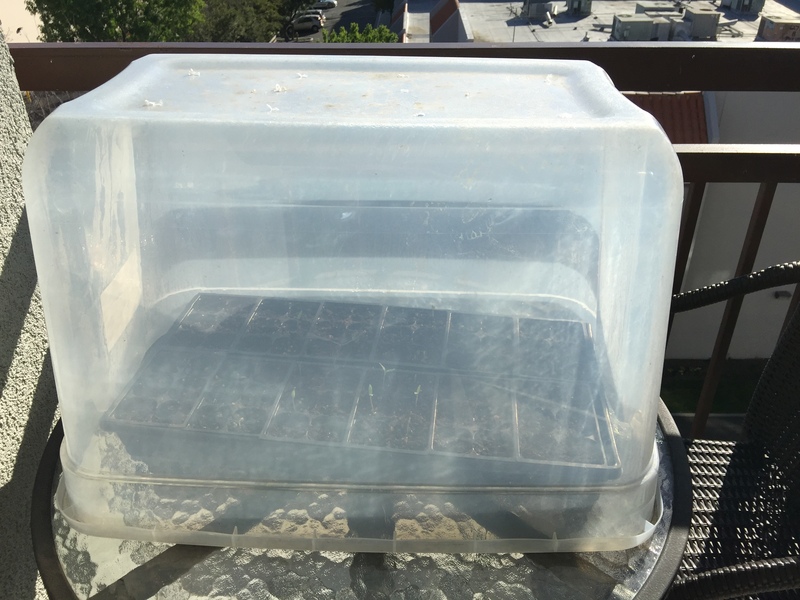 We liked the idea of the clear plastic top, however this top rests very close to the top of the seedlings and has no ventilation holes. If the clear cover is left for very long in direct sunlight, the plants may overheat and be killed. This not only happen to us, but also with a neighbor gardener who tried the same set-up. We will discuss our solution below in the post. It is important that the potting soil for seedlings has several attributes. The soil needs to be made of fine particles that will hold water around the seed. 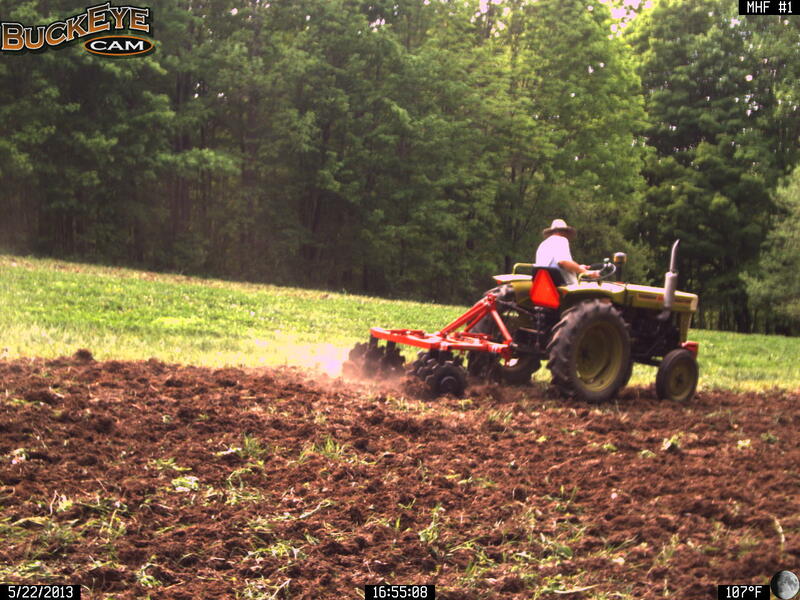 The soil needs to be sterile so that it will not have weed seeds, fungus organisms, or other organisms. 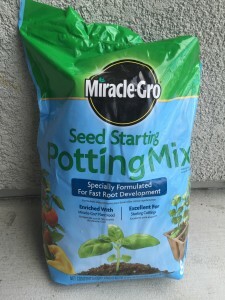 Fertilizer needs to be contained in the potting soil or needs to be added to the soil, so that the plants have nutrients until the time of transplanting. The potting soil needs to be added to the individual cells and packed enough to eliminate any air spaces in the potting soil. 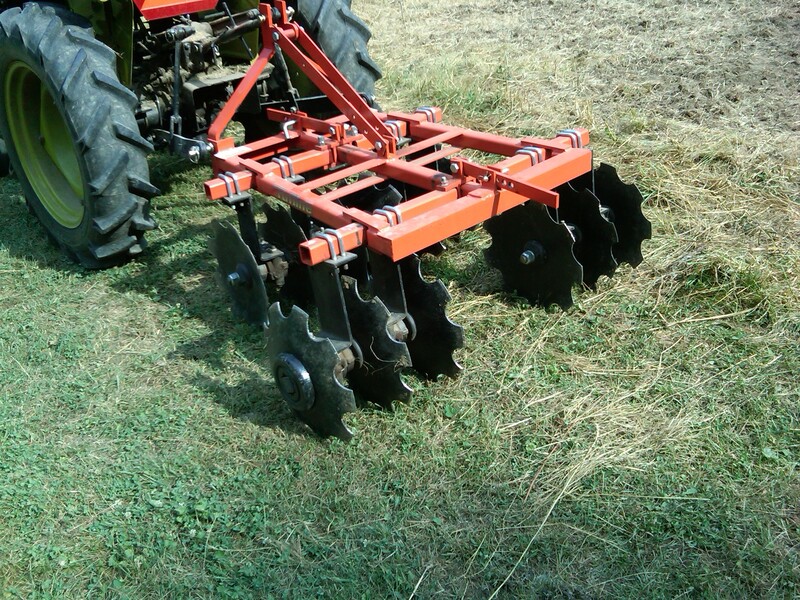 This will help ensure uniform water holding capacity and root penetration. The potting soil should then be leveled a little below the rim of the cells so that the water can soak in when watering without running off. The next step is to plant the seeds at the depth required as described on the seed package. 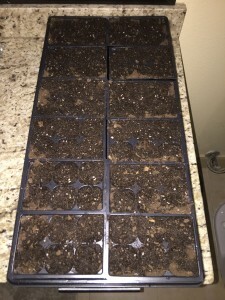 If you have a lot of seed you may decide to plant one or two extra seeds in each cell to ensure all the cells will have at least one seedling. If more than one seed germinates, the extra seedlings can be removed, leaving the healthiest seedling. If you are limited on seed, just plant one seed per cell. 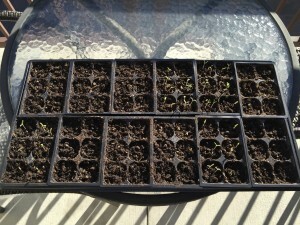 Sometimes it is a good idea to save some seeds in case you have to re-plant due to unforeseen circumstances. 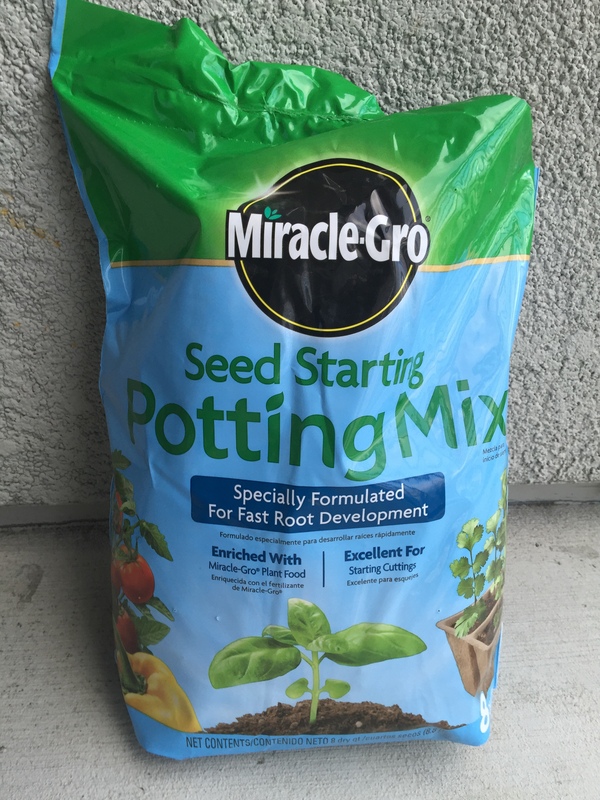 Once the seeds are planted be sure to add enough water so that all the potting soil is saturated with water. Add the water a little at a time to prevent overwatering. Now that the seeds have been planted it is important to meet the germination temperature requirements for each seed type. This information is usually published on the seed package or can be looked up online. Most seeds will germinate at a soil temperature between 65 degrees and 80 degrees. Some seeds will germinate at cooler or warmer temperatures. In order to keep the soil surface moist, a barrier of some type will help to do this. This can be in the form of a plastic cover or possibly a light colored, coarse weave fabric cover. It is important to have ventilation to prevent overheating especially if using natural sunlight. 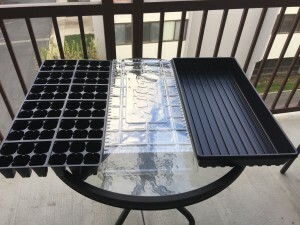 If you intend to grow a lot of seedings a heating pad designed for seedlings can be purchased through an online gardening supplier. The heating pad can be set for the exact temperature that your seed needs for germination. For indoor growing, special growing lights can purchased and installed over the seedling trays. We seem to have had the most success using an upside down clear plastic storage container with ventilation holes drilled in the bottom of the tub which becomes the top of the mini greenhouse. This top covers the entire planting tray. The holes can be drilled with larger or smaller holes depending on the outside temperature. 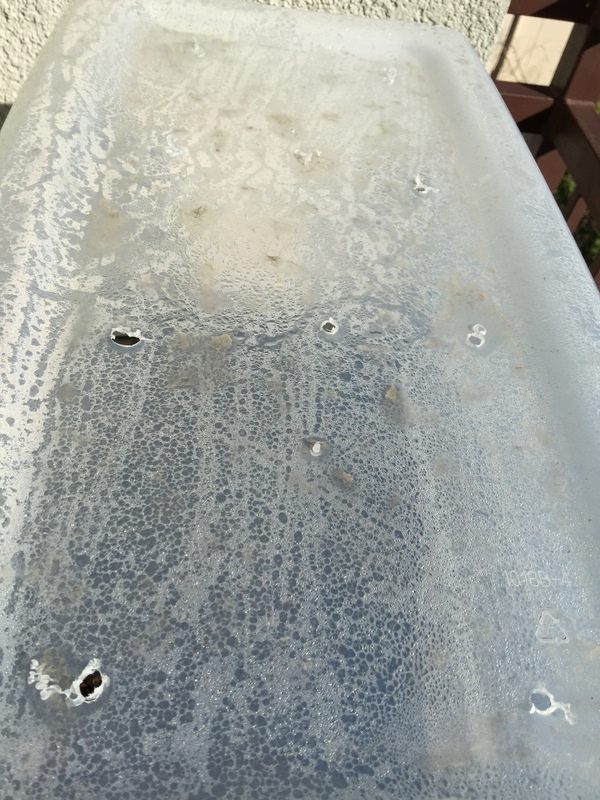 We have about eight 1/4 inch holes drilled in our tub. For a tub that is in direct sunlight all day, we increased the hole size to 1/2 inch diameter. 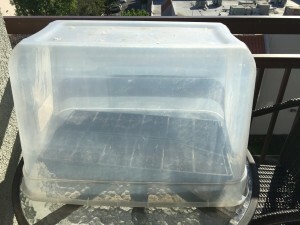 The height of the tub allows the heat to rise above the seedlings and venting the hot air out through the top. The tub still holds most of the moisture under the tub keeping the humidity high near the seedlings. The high humidity helps with germination and prevents the potting soil from drying out too quickly. We have found that this type of cover is heavy enough to resist light winds and can be further secured by placing a weight on top such as a small brick or stone. 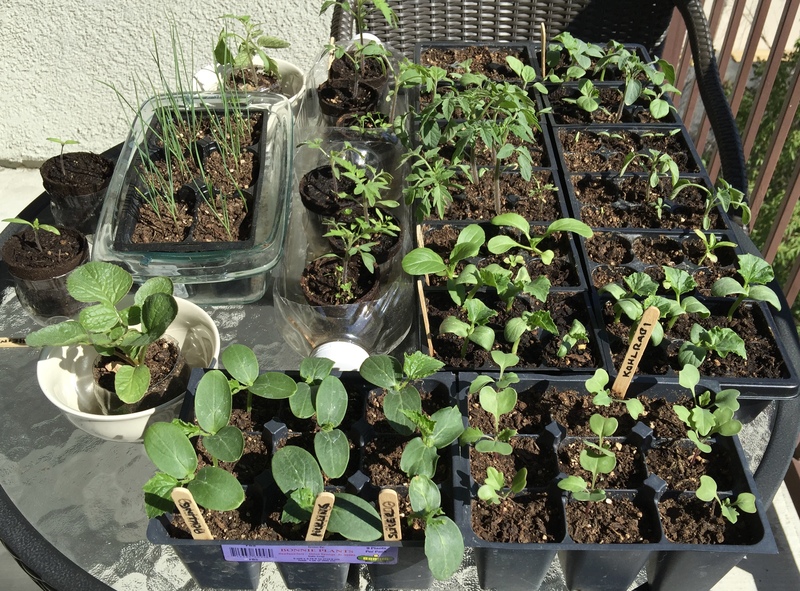 We have cool nights here and sunny days, so we have been putting the seedlings outside during the day and bringing them in the house at night. The house temperature is at least 70 degrees. 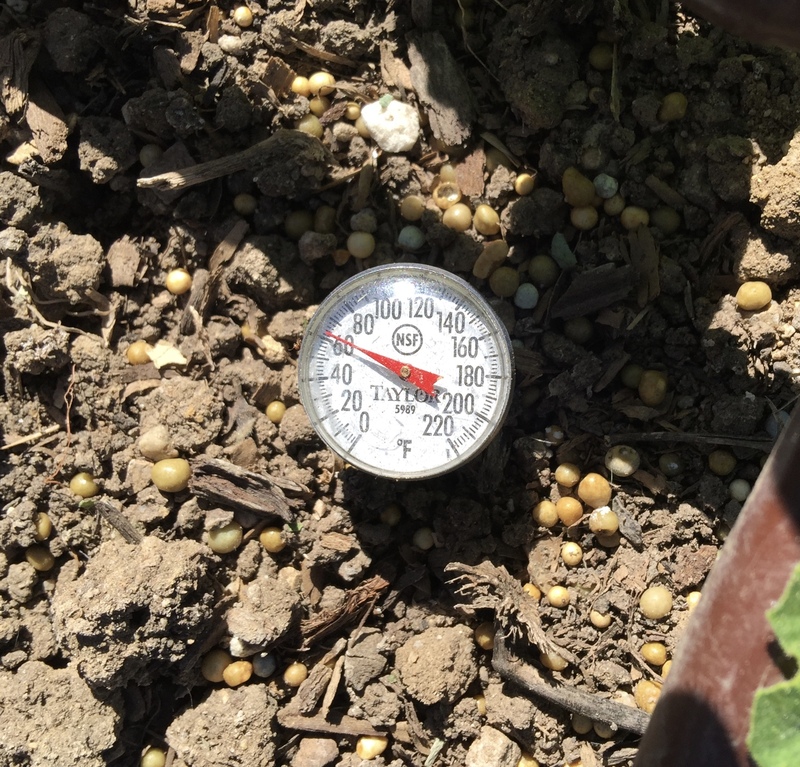 The outside sunlight has been raising the temperature under the tub higher than 70 degrees for most of the daylight hours. 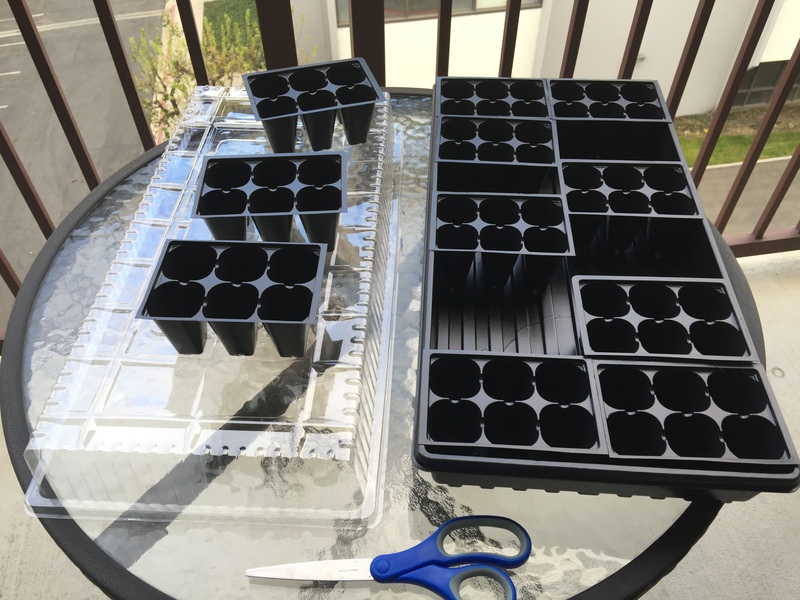 Seeds will take anywhere from a few days to a couple of weeks to germinate. This information should be printed on the seed packet or can be looked up online. 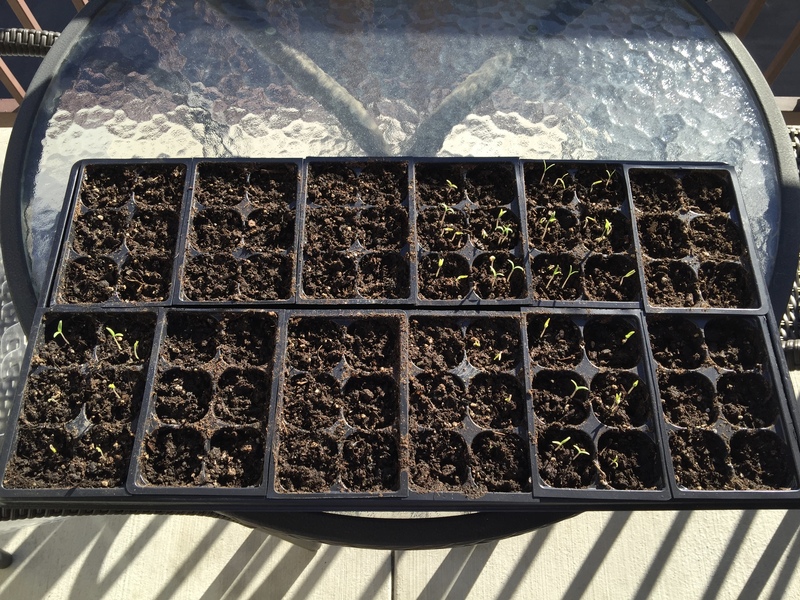 In our case, the tomato seedlings are up and growing after a week, but we are still waiting on the eggplant seedlings which will take at least another week to germinate. After trying several configurations of small or mini greenhouses, we like the Coke® bottle mini-greenhouses, with 2 inch peat pots the best. It is easiest to control the environment, one on one, with each seedling. The 2 inch peat pots are easy to remove for transplanting without damaging the transplants. We did need to fertilize the seedlings several times. 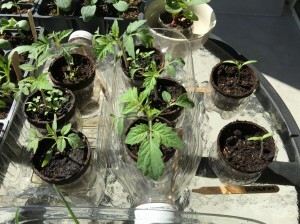 The amount of nutrients in the potting soil was not sufficient to supply the necessary fertility until the seedling was ready for transplanting. The seedlings do require a lot of daily maintenance, including watering, managing sunlight availably, daytime and nighttime temperatures and wind. The seedlings also need to be thinned, most often, to one plant per unit.